Various "solutions" have been suggested, the most common being a dongle with a capacitor and a resistor. While this works, the tune period is fixed and it will not tune reliably twice in short succession. The fixed tune period is particularly problematic if you use your radio with a high power amplifier as if you see a mismatch you will want to act quickly. Our Click2Tune for ICOM system provided you with complete and reliable control. It transmits a low power carrier (user selectable level on some radios) without any need to change the mode and for as long as you press the button - YOU are in control. We worked hard on getting the ergonomics right so that it sits nicely in your hand and we even trialed three types of buttons before we found one that had the right size and "feel".We also made it look good to fit in with your shack. It's a great accessory for any ICOM radio that supports their auto-tuner. Tested on: IC-7300, IC-7600 (ant. 1), IC-7600, IC-7610, IC-7100, IC-730, IC-746 (ant. 1), IC-9100 (ant. 1), IC-706 (all variants), IC-703, IC-746. See below for further information on compatibility. The Click2Tune for ICOM is available as a kit or ready built! We have also written great instructions (build time around 30 minutes). Double-sided professional PCB and other parts (total 17 parts). Click here for instructions for making up the Click2Tune kit. Will it work with my ICOM radio? 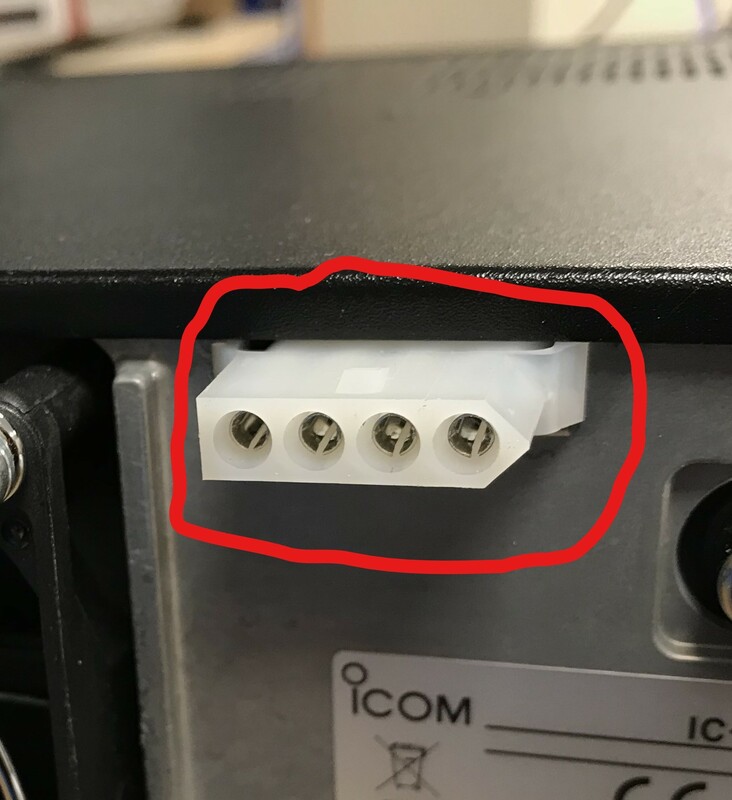 If your ICOM radio has a socket like this on the back, the Click2Tune will almost certainly work with it. Different radios will have the socket in different positions on the back panel. This product is not suitable for the IC-7700 (and probably other 200 Watt ICOM radios). The Click2Tune simulates a successful tuning sequence for an external AH4 tuner. There is also a switching sequence that is used by an external automatic tuner to indicate it failed to find a match. The Click2Tune appears to the transceiver to be a successful tune so sets the display as such. The 'TUNE' indicator simply indicates the transceiver's circuitry detected a successful external AH4 tune sequence. It does NOT indicate the internal tuner is in line. Makes tuning my Icom IC 7300 & 7600 so much easier without having to reset Mod and power output. Ideal when using an amplifier. What a great piece of kit. The site has very easy to follow instructions to build this kit. I have a tube linear and my 7300 had no way of sending a low power carrier without loads of messing around. This is just perfect! I press the button to tune the ATU and then switch to operate on the linear and tune that. Excellent piece of kit! Recommended! Just connected my Icom 7200 to the click2tune and it works a dream. No switching to AM or CW to fire up a carrier, the click2tune works and the auto ATU sniffs the RF and its done. Brilliant piece of work and proves the point that Richard at Sotabeams gets it right. Just ordered another one to connect up with my Icom 718. Kenwood has had this key on their transceivers for a long time, Icom is still missing them today. This defect has now been resolved and so I can vote my remote automatic coupler finally with low power. Faultless service, good price, quality components, and SUPERB instructions with the kit version. And it does the job perfectly. I like to use my 7200 in the field with a manual antenna tuner but the process of dropping the power, changing mode, tuning and then Switching it all back was just not fun. I ordered this as a kit from DX Engineering and put it together in about 10 minutes. It's a very simple build. It works great with this radio. Press the button, adjust the tuner, let go of the button...... That's the entire process.. Another great product from Sotabeams. Easy to assemble. Works great!